A couple of weeks ago I found a FedEx package at my front door and opening it up I was excited to find a Motionize paddling tracker inside. It you haven’t seen it before, Motionize is a system of two sensors (one attached to your paddle and the other on the deck of your kayak) that when used in combination with your smartphone can provide instant feedback to help dramatically improve your forward stroke. The Motionize system measures a wide variety of specific items including, strokes per minute, stroke length, distance traveled per stroke, total number of strokes, all instantly displayed on your smartphone via the Motionize app. Initial setup is pretty quick and easy. After attaching the paddle sensor you need to wirelessly connect both it and the kayak sensor (this is built into the housing) to your smartphone via Bluetooth. The Motionize app itself is easy to configure as it walks you through a series of questions to get an idea of the size of your kayak and length of paddle. It also takes into account if you paddle with a wing, euro or Greenland paddle which I thought was really interesting. I will be honest with you, before using it, I was super skeptical as I wasn’t sure how accurate the data it collected was or even if it would useful. But it didn’t take to long for me to realize just how accurate the sensors were and after about 10 minutes I looked at the data and the first thing I saw was that I was pulling harder on one side and compensating by increasing my stroke length slightly longer on the other. It was subtle enough that I had no idea after all these years. Now you might be asking yourself, "but that deck housing seems super big and clunky." It is. It’s big and heavy but in the time since I received this review copy the people at Motionize released the completely redesigned unit called the Edge which replaces the big housing with a small deck sensor and a universal smartphone holder that fits most waterproof cases and bags. Just looking at it, I think it’s a much improved system over the older version that I tested. If you are thinking of purchasing, you should consider that option. If you are a kayak instructor I think this could also be an interesting tool. While the sensors are designed to stick with double sided tape, you could temporarily attach it to student’s kayaks with electrical tape which would provide them with instant feedback on their forward stroke performance. Got to say that I was nervous of keeping my smartphone in a waterproof bag but still exposed on my deck to the elements or possible loss (it’s expensive!). The included tether helped keep that at bay. The unit I had was big and clunky though it shouldn’t be a problem for the newly released smaller version. Depending on the age of your smartphone, battery life could be an issue due to the fact that the screen is always on and Bluetooth activated. The MSRP the smaller Motionize Edge is $249 and can be purchased on their website at motionizeme.com. While there are several other kayak training/recorders out on the market, Motionize is one of the only ones able to develop a product that’s also very accessible for recreational paddlers. Most of the other ones I’ve seen are either super complex to operate or are specifically designed for one type of kayak (surf skies for example) making them limited to anything outside of the competitive world. If you are looking to squeeze out a bit more performance you should check out the Motionize for sure. Disclosure of Material Connection: I received the Motionize system from the manufacturer in consideration for review publication. A new episode of Ken Whiting's online TV show, Facing Waves just got posted their and this time it focuses on my buddy and fellow team P&H Kayak paddler, Ray Boucher from Wawa, Ontario. 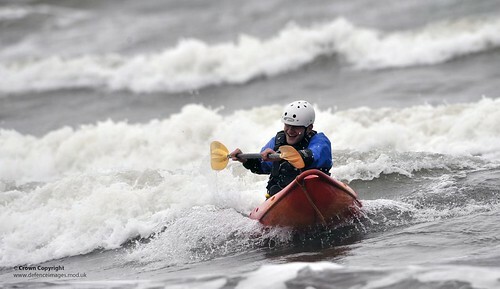 This episode focuses on rougher water paddling on Lake Superior. The cinematography looks great and I think you will agree that the camera really brings out Rays eyes. Jonathan Reggler shot this very cool piece of footage recently of at least two Orcas swimming through a group of sea kayakers while playing in the tidal currents of Surge Narrows. Good thing the paddlers got out of the way in time. It reminds me of kids playing hockey in the street and having to yell Car! every time when one goes by. Facing Waves is a new paddling and travel web TV show that you should check out on the YouTube. Hosted by Ken Whiting, Facing Waves highlights some of the awesome places to paddle around North America such as the Ottawa River, up north on the Hood River, Georgian Bay and Baja. I was really excited to hear that their latest episode features my buddy, Ray Boucher who was working for Naturally Superior Adventures last fall when the episode was shot. In the latest segment, Ken and Ray head out to explore the gorgeous coastline of Lake Superior Provincial Park but along the way they ended up having an encounter with a bear which almost cut their trip short. Anything that's 3D printed is just awesome in my books. Doesn't matter if it's this thing or that thing, it's awesome. Leave it up to Jim Smith over at Grass Roots Engineering to take things to the next level with his latest project, a 3D printed sea kayak. Oh my. It looks like another group of kayaks got in trouble with Johnny law over the weekend when they were caught trying to smuggle in 297 pounds of marijuana worth around $178,000 from Mexico into the United States. Work is boring so here is tease of 12 people having way more fun outside then you are sitting inside. 1) This guy surfing in the waves. Check out this crazy footage from the Discovery television show, North America which features footage of two sea kayakers who got the the thrill of their life when several Humpback whales broke the surface about 20 feet away to feed (not on the paddlers luckily). All this footage is shot somewhere in Alaska. I can confidently say that I would freak out in this situation. How do I know you ask? I get scared startled seeing a floating stick on the water and think it's a giant snake going for my throat. Last week I had the amazing privilege to guide an eight-day sea kayak expedition on Lake Superior for Naturally Superior Adventures. The route started with a boat shuttle out to Cozens Cover at the eastern end of the very remote Michipicoten Island. From there we worked around the island clockwise before making the 18km crossing to the north shore and back towards Wawa and Naturally Superior Adventures. Here is the full route map (new window). This trip was different than a typical guided trip in that each participant was responsible for their own food, camping gear and boat. My role throughout the trip wasn’t to do the cooking (they would have starved to death if they did) but rather to get everybody back home safely. Lets cut to the chase, Michipicoten Island is wicked awesome. If it isn’t already on your bucket list of trip destinations, you need to add it. Even if you just plan on circumnavigating the island as the vast majority of visitors do, you will die a happier person (hopefully long after the trip is done). The island is home to over 400 caribou wandering around the place. In our case we only saw four but another guided trip out the week earlier reported seeing 15-20. The geography on the island is quite unique since a lot of the rock is volcanic in nature and most of it is over 470 million years old. Geologists believe that the island was part of an ancient vent in the earths crust that got filled with magma. Over the years there has been extensive exploration for minerals from everything like copper, gold and diamonds. You can still find agets on the island if you know where to look. There is an old copper mine ready for your exploration. Quebec Mines was a copper mine that was abandoned back in the 1880’s. Since then the trees have reclaimed it but walking around you can find lots of old machinery including old boilers and massive iron gears scattered about. Exploring the area you realize that the people working back then had more manliness in their pinky then you do in your entire left leg. Be careful walking around the old mine as there are several overgrown old mine shafts that you could easily fall into so step lightly. Along the south shore of the island make sure you explore the the three sunken ships that are in Quebec Harbour. They are relics of the large fishing camp that operated during the fishing peak of 1930-40. The camp was abandoned in the 1950’s after the fish stock collapsed. The crossing from the island to the north shore of Lake Superior was something that was always a concern in the back of our head. We had a two day window to make the crossing so it came down to figuring out which day was better. We decided to make the jump on the trips third day and cross north from Bonner Head. This meant that we only made it around 3/4 of the island but if we kept going and crossed the next day (from the east end of the island) it would mean a very strong head wind and medium seas. I believe we made the better choice and was on the water at 7am with light tailwinds. Just over three hours later we were on the north shore patting each other on the back, happy with our accomplishment. Michipicoten Island has a long history of failure over the years. Explorers to the island had dreams of striking it rich through mining or fishing but more times than not they were sent home bankrupt. It was a very tough place to try to make a living. Talking to the owner of Naturally Superior Adventures, Dave Wells, we figure that less than 50 people visit the island each year and we were one of only two commercial trips that will visit this year. Also, the route that we took by crossing and paddling home has only been done by about 20-25 people in the past 15 years so as you can guess, Michipicoten Island is a pretty remote place. Due to that remoteness, if you do go, you need to make sure that your paddling and rescue skills are rock solid. There are several sand and cobblestone beaches to camp on but they can be few and far between in certain points so plan your day out carefully. Finally don’t count 100% on your VHF radio being able to access the Canadian Coast Guard in the event of an emergency. Due to the high mineral count in the rocks, there were several places along the north shore where you will be in a radio shadow and unable to get a signal. On a trip I took out there in 2007 we had a difficult time reaching the Coast Guard and had to paddle offshore about a mile or so to report in one evening. To help out with our risk management plan, inReach Canada sent me one of their newly released inReach SE to put through it’s paces. The inReach SE is a two-way satellite communicator that allows you to send short text messages to anybody in the world from anywhere. It has a built in keyboard similar to your old cell phone so it doesn’t require you to connect your smartphone via bluetooth (though that option is there if you want). I’m working on a more extensive review but the real short review is that I was blown away by the unit. The fact I could send a note to the NSA base (or my wife) letting them know where I we were located was amazing. Even better, a couple of days I sent them a request for a more precise weather report then what was on the radio and 15 minutes later we had the response. I did find a couple quirks with the unit but I will hold onto them until I publish the detailed review. Overall, I was very pleased with it. Should you do the trip next year? Of course you should. I would tell perspective paddlers that they should be comfortable in medium seas with 2-3 foot swells and have a firm grasp on both rescue and camping skills. Here is a very cool short documentary that I found while researching the island. It gives a very good idea of what you can expect when you visit next. If you want to see more photos, stop by my flickr page and scroll through the collection or click through the slideshows below.